Dictator. Madman. Murderer. Adolf Hitler is remembered throughout the world as the epitome of hatred and evil. Yes! I’d like to buy Adolf Hitler Collectors Edition! In this fascinating Special Issue you’ll witness Hitler’s rise to power, including his failed 1923 coup known as the Munich Beer Hall Putsch and his eventual decision to seize power through political process, with his Nazi minions at his side. Follow along as Hitler’s series of risky decisions led to Germany’s invasion of Poland and the start of World War II. 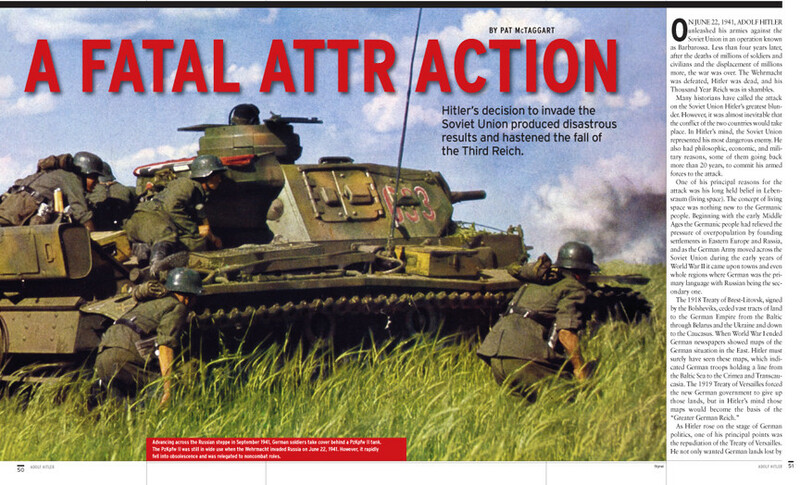 Then, after crushing French and British forces, you’ll witness Hitler’s disastrous invasion of the Soviet Union. Three years later, as the Allies close in, watch as Hitler orders his Generals to turn and attack Eisenhower’s army, precipitating the largest land battle the world has ever known: the Battle of the Bulge. 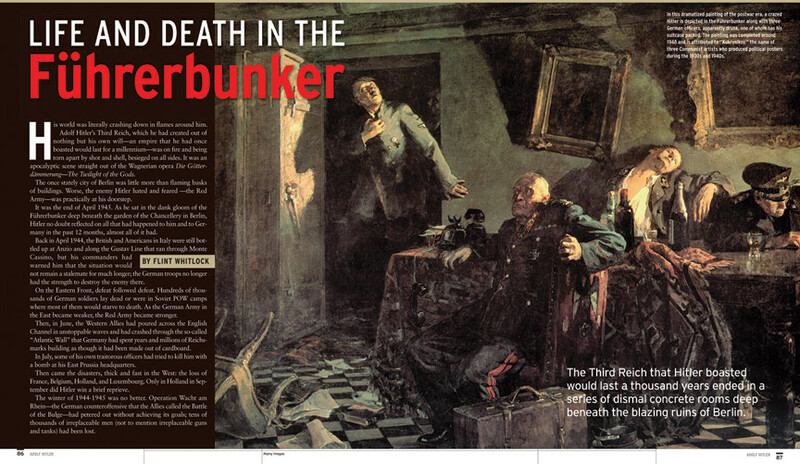 Then see inside Hitler’s Berlin Bunker, where he spent his last, delusional days, and where he, his mistress Eva Braun, Josef Goebbels, and Goebbels’ wife and children committed suicide while the Soviet Army crushed final German resistance and destroyed Berlin. You’ll read a fascinating who’s-who of Hitler’s Henchmen, including Hermann Göring, Rudolf Hess, Heinrich Himmler, Josef Goebbels, Albert Spear, and other top Nazi’s who eagerly did Hitler’s bidding. You’ll learn how Hitler convinced Germany’s top ministers to accept the “Final solution” to the Jewish problem, ensuring shared complicity between the killers, and agencies of the government. Order Adolf Hitler Collectors Edition Now! Its Easy and Fast! The cumulative effect of the treaty requirements fostered a sense of injustice among the Germans. 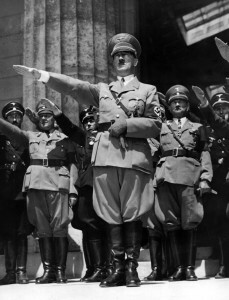 Hitler and the Nazi party came into power on a promise to right the wrongs of Versailles and make Germany the most powerful country in Europe, and the world. Adolf Hitler Collectors Edition Special Issue chronicles the history of Hitler’s life, from his birth, to his time spent homeless in Vienna; his eventual rise to power, and his final death beneath the streets of Berlin. On the night of November 8th, 1923, Hitler and two thousand of his followers surged outside of a beer hall on the streets of Munich. Their march on the Weimar government would be stopped dead by the gunfire of the Bavarian police. The event would catapult his small and obscure movement, the National Socialist German Workers Party (NSDAP), into the national and international spotlight. The NSDAP would become known as the Nazi Party, and in nine years they would be elected democratically into power in the Reichstag. In another year, they would confer absolute power to their Chancellor Adolf Hitler, proclaiming him Fuhrer of the Third Reich. But who was the man behind the movement? And how in such a relatively short time did Hitler’s party change Germany’s political climate so dramatically? In Hitler’s Road to Power, you’ll learn the history of Hitler’s life, starting with Hitler’s father who married his niece, Klara Polzl, Hitler’s mother. Hitler’s father died when Hitler was 14 years old. Three years later, Hitler failed his admissions test for the Vienna Academy of Fine arts, for which he blamed the Jews. A year later, his mother died of breast cancer, leaving Hitler alone, and prostrate with grief. Hitler’s life spiraled out of control, and he eventually became homeless, when he started reading anti-Semitic pamphlets, and developed the central core theory of his life that Jews, as a race, were destroying the German people. Eventually, Hitler developed a hatred and contempt for nearly every level of organized society, a hatred which echoed the sentiments of an angry and humiliated nation. In Hitler’s Speeches you’ll see up close the details behind the carefully constructed facade Hitler built around himself. When Nazi architect Albert Speer surrendered in 1945, he made a strange remark, “So now, the end has come. That’s good. It was all only a kind of opera anyway.” Minister for Popular Enlightenment and Propaganda Josef Goebbels agreed that Hitler turned Politics into a grand play. Even Hitler called himself “the Greatest Actor in Europe”, enjoying contact with movie stars while plunging the world into a melodrama of madness and destruction. This fascinating article takes you behind the scenes of Hitler’s tirelessly rehearsed persona. We’ll show you a series of secret photographs taken by Heinrich Hoffman, which Hitler ordered to be destroyed. 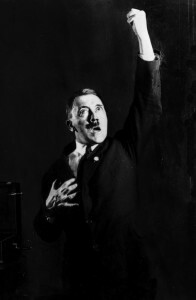 These revealing photos show Hitler practicing wild gestures, to perfect the art of mass persuasion. Hitler’s Henchmen gives the fascinating background on each of Hitler’s top lieutenants, including Hermann Goring, highest ranking German military officer of all time, and eventually named successor to Hitler; Rudolf Hess, who ran the Nazi party organization during 1933-1941, and planned a secret diplomatic mission to broker a peace deal between Great Britain and Nazi Germany in 1941; Martin Bormann who was Hitler’s go-to man for everything, from giving Hitler’s girlfriend her allowance, to keeping his cars running; Heinrich Himmler, Chief of the German police, who expanded the SS from a few hundred men to hundreds of thousands; Joachim Von Ribbentrop Hitler’s second foreign minister; Albert Speer, Germany’s head of war production, whose lasting legacy was that wars cannot be won via airpower alone, but must be accompanied by boots on the ground. His production miracles took place during devastating allied wartime bombing raids that destroyed factories, Speer simply moved the factories underground and went on. Wilhelm Keitel, Hitler’s servile ‘Yes Man’, Alfred Jodl, Keitel’s ever-critical deputy, and unrepentant Nazi admiral Erich Raeder would also play their role in Hitler’s terrifying war machine. The Killing Squad details the Nazi Einsatzgruppen (Special Task Forces) commanded by young, motivated, highly educated soldiers who in their civilian life were lawyers. However the war that the Einsatzgruppen fought would not be against the militaries of the behemoth Allied cause, but against the ideological ‘enemies’ of Hitler’s Third Reich. The Nazi Einsatzgruppen became the right arm of Hitler’s extermination campaign, murdering Jews, gypsies, homosexuals, and communist party officials. 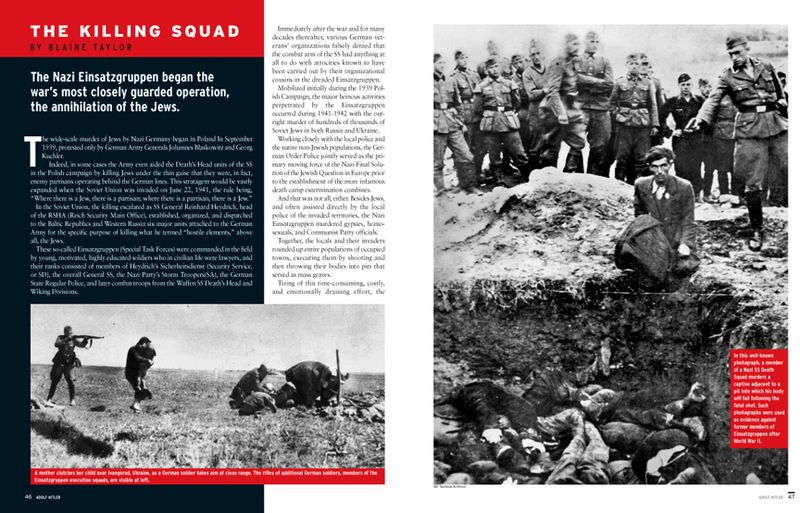 Accompanied by haunting photographs, The Killing Squad is a truly chilling account of some of the Third Reich’s worst atrocities. A Fatal Attraction gives a detailed, gripping account of why conflict between Germany and the Soviet Union was inevitable. The Germanic concept of “Lebenstraum,” or living space, started in the middle ages, when the Germanic people relieved overpopulation by founding settlements in Eastern Europe and Russia. Many towns and whole regions in Russia spoke German as the primary language. When World War I ended, Russia had ceded vast tracts of land to the German Empire from the Baltic through Belarus and the Ukraine. The Treaty of Versailles forced the new German government to give up those lands, but in Hitler’s mind, those maps would become the basis of the “Greater German Reich.” Many historians consider the attack on the Soviet Union Hitler’s greatest blunder. How the Holocaust Happened gives the historical chain of events, starting 4400 years ago, where, settling in Judea and Samaria, the Jews built their capital of Jerusalem. The Jews maintained separate religious beliefs and distinct cultural practices that separated them from other, nearby societies. They practiced a reverence for learning and philosophical thinking centuries before the existence of the early Greek city-states and the Roman Republic. The Middle Ages in Europe were a time of a great awakening of Christian fervor and a desire to expunge any non-Christian thought. In his split from the Catholic Church, Martin Luther was convinced that the Jews would convert to his form of remodeled Christianity and when they did not, he turned violently against them, Finally, at the end of World War I, Hitler heard that the German Army, undefeated on the battlefield, was “stabbed in the back” by Communist and Jewish politicians back home. Hitler resolved revenge, and he found in Germany’s legacy of anti-Semitism the means to that end. 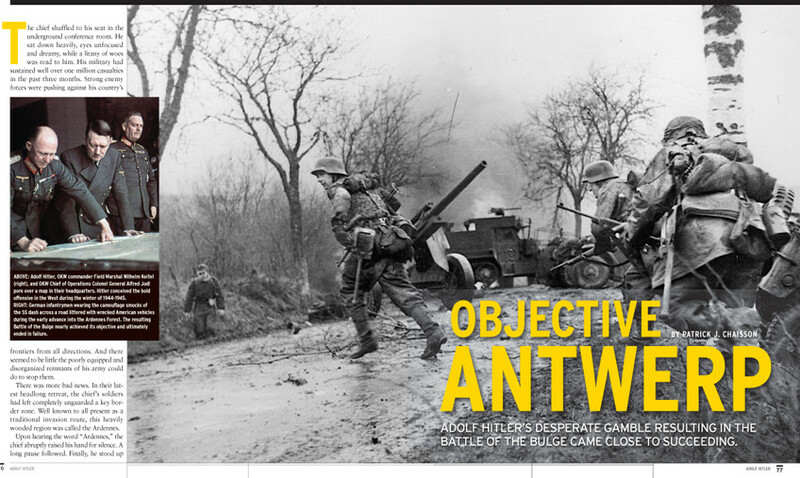 Objective Antwerp details Hitler’s strategic thinking behind the Battle of the Bulge, the counterattack which Hitler was convinced would break the Allied Coalition during the cold of winter. After the failed assassination attempt in July 1944, Hitler became increasingly paranoid, and suffered from failing health. Purging the German Army of many of its leaders implicated in the assassination plot, Hitler insisted that the counterattack be carried out. The Battle of the Bulge, as the counterattack is now known, ended in catastrophic failure, hastening the defeat of Nazi Germany. Certainly the best researched, most complete volume ever produced on Adolf Hitler in World War II, you can order our Collectors Edition Special Issue, Adolf Hitler, right now. Simply click on the button below, and you can order our 100 page special issue print or e-Book edition for $14.95, or both for slightly more. Order Now!